Posted September 22, 2016 by Dr. William Myers & filed under Oral Health and Prevention, Senior Oral Health. It used to be incredibly common to lose teeth as we grow older. But thanks to advancements in dental technology, that’s really not the case anymore. According to the American Dental Association (ADA), Americans are keeping their own, natural teeth longer than ever. 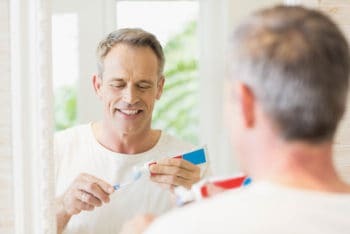 However, at my Warsaw dental office, we know that the longer we keep our teeth, and as we age, the more we need to pay attention to some common oral health issues. Each one of these dental issues can lead to tooth loss if not caught and treated quickly, so it’s crucial to maintain regular dental checkups with your dentist in Warsaw every six months. If you’re over 50 and don’t have a dentist, we strongly recommend finding one that you trust to evaluate your current dental health and discuss any potential problems you may have. Not sure where to start looking for one? Call my dental office in Warsaw and schedule an appointment today. We’ll be happy to see you and get your mouth healthy — for life.